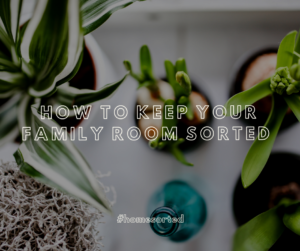 How to Keep Your Family Room Sorted - Home Sorted! If your family room could use a little organisation – you’re in the right place. We understand that perfect is not sustainable for most families – but with a few handy tips you can get your family room sorted and keep it that way. Keen to learn more? Read on. Before you start sorting anything, it’s a great idea to consider the functionality of the room. Do you have kids? What activities will be happening in the family room? Will you just be watching TV? Once you know the functionality of the room you can consider the layout and any storage solutions required. One of the best investments you can make for the family room is selecting furniture that comes with added storage. Coffee tables that contain a shelf or drawers are a great addition as they allow you to keep frequently used items at close reach and out of sight – isn’t that great? We also love ottomans or footstools that double as storage. These can be filled with board games, pillows or even blankets. Flat surfaces are a breeding ground for clutter – that’s why we recommend keeping flat surfaces as clear as possible. Small trays can be utilised on coffee tables to keep important items grouped together. The family room is a place for play! If you have kids in your family, we love the idea of creating a play zone for your kids. This can be an allocated section of your family room where toys are stored and played with. You can group kids’ items together in baskets or boxes (stackable ones are always great) to ensure that these items don’t migrate over the entire family room, thus keeping it sorted! One of the easiest ways to keep your family room sorted is to get into the habit of tidying-up every evening. Remove all cups and plates to the kitchen, toss newspapers and magazines into the recycling bin and ensure that your kids are putting their toys away at the end of each day. This may not sound like much, but small changes make a big difference when it comes to keeping clutter at bay.